Can you beat the odds? The ultimate in corporate themed shows! Perfect for corporate Casino themed shows & events – The is Australia’s only truly “Vegas Heist” themed show. “BANNED!” is an incredible show available in two forms, the Solo show, or the Full Vegas experience. 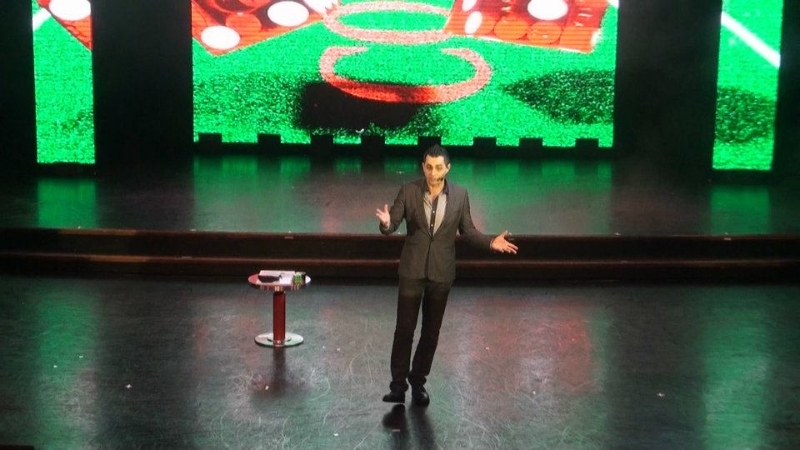 is 30-45 minutes of mind-blowing casino themed routines, answering one of the most popular questions – “Are you banned from casino’s?”. Audience members join in the fun on stage with Phoenix as he demonstrates his ability to use his powers as one of the world’s top mentalists to beat the casino at their own game. This show includes audience participation, comedy, hustle, and heist themed routines, & even a chance to beat Phoenix with a cash reward! is 45-50 minutes including much of the solo show, as well as showgirls, and finishing in a thrilling escape, direct from the stages of Las Vegas – Phoenix’s signature Water Tank Escape finale. This show has it all, the glitz, glamor thrills, and hustles of the world’s greatest casinos! the gorgeous Cabaret/Burlesque group The Darling Diamond Dolls and their lead vocalist Miss Becky Vee Verrier, & guest starring Phoenix. If you are looking for a mix of dazzling cabaret showgirl and burlesque dance routines, powerful vocals and a touch of casino-themed hustling and illusion routines, then this is the show for you. Card and Psychological Hustler? Phoenix was chosen above all magicians to advise on the set of & train the main cast of “XMEN Origins: Wolverine” in magic & card work for the casino scene. Phoenix also headlines most major cruise lines globally & has appeared on various Australian & international prime time television shows! Secure your booking with him before Las Vegas Snatches him up for good & get “BANNED!”, the ultimate in corporate casino themed shows. Don’t miss out on these amazing shows for your next casino themed event, Book Here!